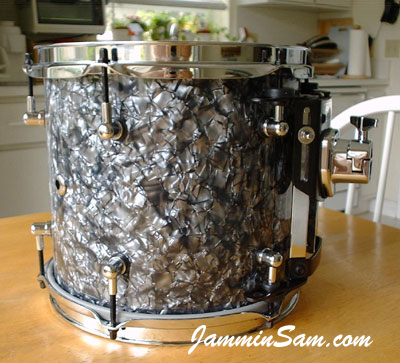 Picture received April 2003 from Juda Shkolnik of Miami, Florida of his 10×9 custom built tom. Awesome job Juda! This is the first drum I’ve put together, not just a recover job. I’m very happy with the results, it sounds great and looks awesome. I can’t wait to build the rest of the set. The tape-on system is very easy to apply. Thanks for the informative help and fast service. This color is slightly lighter/grayer than our “Black Diamond Pearl (Old)”, but the pattern is the same for both colors.